If there is one thing that I cannot hold against Apple, then it would be this – they make really, really good looking devices. In fact, their hardware are so pristine and clean looking, that it feels almost like a waste and anathema to add on protective accessories in order to preserve such beauties. Having said that, a keyboard cover is something that some of us do make use of, in order to prevent unwanted bits and pieces of food crumbs falling in between the keys. 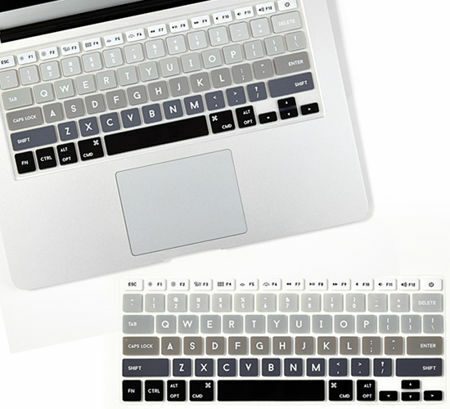 Well, if you think the same way with your new Mac, then the $14.99 Grayscale Mac Keyboard Cover might be of interest. It’s totally washable and is made from flexible, durable, waterproof silicone, taking around 2 seconds to slip on and off. One major drawback though – it would spoil the serene beauty of your Apple machine the moment it is on.